Ranger™ Long Range Transmitters and Receivers comprise Farpointe Data's long range radio frequency identification (RFID) solution, offering exceptionally long and secure transmission ranges of up to 150-feet (45 m). 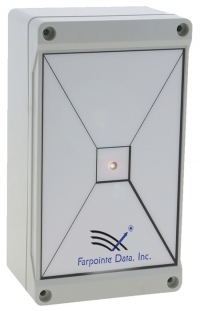 At the click of a button, users will find Ranger™ to be ideal for a host of electronic access control demanding applications, such as opening parking gates, raising and lowering vehicle barriers and sliding open doors, as well as those applications requiring emergency duress. And like a proximity tag, each Ranger™ Transmitter may also be used as a short range proximity credential, compatible with the entire range of Pyramid Series Proximity™ readers. The model WRR-42 is a long range radio-type receiver, it features a Transmitter receive range of up to 150-feet (46-m) and is ideal for applications involving vehicle or disabled access. The model WRT-2+ is a 2-button clicker-type access credential, featuring both long range (upon button push) and proximity operation. The proximity component of model WRT-2-H is HID® compatible. The proximity component of model WRT-2-A is AWID® compatible. The model WRT-4+ is a 4-button clicker-type access credential, featuring both long range (upon button push) and proximity operation. The proximity component of model WRT-4-A is HID® compatible. The proximity component of model WRT-4-A is AWID® compatible.